PULL STATION provides immediate unlocking of one door or all doors on the same circuit while providing local annunciation. 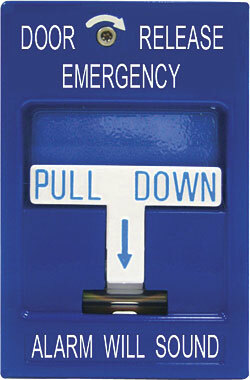 The SDC 492 emergency door release pull station with built-in alarm includes 2-SPDT dry contacts, internal alarm and a blue finish that is not confused with fire alarm stations. Auxiliary contacts may be used for remote annunciation.